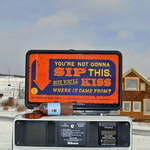 This anti-tobacco effort (via The Media Artist) appeared on gas station dispensers in Wyoming. Above a bottle dripping sludge, a bright sign reads, "You're not gonna sip this. But you'll kiss where it came from?" Campaign URL: WY.Quitnet.com. We didn't get it at first, mainly because when we think "tobacco" we think "smoking," and we spent a brainfucked eight minutes pondering whether there's a connection between cigarette toxins and fossil fuel. And then IT HIT US. That sludge is SPITTOON FODDER from CHEWING TOBACCO. The office resounded in a collective "...Ohhh" as we all got it at the same time. Chewing tobacco. Big problem in Wyoming? We thought only cowboys and baseball players did that. (Remember the gum?) Now we'll have something to ponder through Easter weekend as we smoke away the pain of being too old to participate in egg hunting. Fill your easter eggs with money, it's a sport for all ages. The thought of adults crawling around for pastel eggs full of money makes me laugh. Thanks Kat.